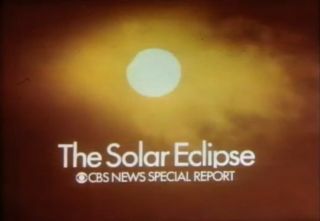 A screenshot of the March 7, 1970 total solar eclipse TV special by CBS news. Until 1951, solar eclipses were only visible to spectators in the right place at the right time to observe the skywatching events. On March 7, 1951, an annular total eclipse was broadcast for the first time. This week marks an unusual, and perhaps unsung, anniversary in both the history of astronomy and television: Sixty years ago, a solar eclipse was televised to a national audience for the very first time in history. And yet, despite this landmark event in skywatching history, the March 7, 1951 broadcast (which shows the new moon blocking part of the sun) involved a solar eclipse of such little value — astronomically speaking — that the curator of one of the country's major astronomical institutions suggested that folks ignore it altogether! The eclipse in question was an annular solar eclipse. The word "annular" is derived from the Latin for "ring-shaped." On March 7, 1951, the moon was positioned in its orbit at a point just a bit too far from the Earth, making it appear slightly smaller than the sun in angular size. When the moon was centered exactly over the sun's disk as seen from Earth, it was the celestial equivalent of placing a penny atop a nickel — the nickel in this case being the sun. This NASA graphic depicts the path of the March 7, 1951 annular solar eclipse, which was the first televised solar eclipse in history. Like many solar eclipses, the televised 1951 spectacle was confined to a narrow band that passed mostly over the open waters of the South Pacific Ocean. For about 2,000 miles (3,218 kilometers) on either side of this track, a partial eclipse would be visible. From New York City, the eclipse would take place near sunset, but only about 17 percent of the sun’s diameter — or a little more than 8 percent of the total disk area of the sun would be covered at the peak of the eclipse. When The New York Times asked Robert Coles, curator of the Hayden Planetarium at the time, about it, Coles made a request to the newspaper: "Please, I ask you, don’t get people too excited about it." "You see," Coles continued, "if we get people expecting a big show they’ll be disappointed. Then they won’t pay attention when we have a genuine celestial wonder to call to their attention. Please keep this quiet." Apparently, however, local television stations did not listen to Mr. Coles. Instead, two of them decided to incorporate the eclipse into their regular afternoon schedule. On WCBS, Channel 2, at 5:15 p.m. ET, according to that day’s television highlights, the "Annular Eclipse of Sun" was featured on the Chuck Wagon Playhouse Show. Explaining the eclipse on that program was Robert E. Cox, a popularizer of amateur telescope-making, who later went on to write a popular column for over two decades in Sky & Telescope magazine. But it's more likely that most television viewers — especially kids — got a look at the eclipse on another program, for at 5:30 p.m. ET on WNET, Channel 4, was the Howdy Doody show, hosted by "Buffalo Bob" Smith. "NBC used Howdy to inaugurate all sorts of new TV technology – the split screen, matte effects and strange fades. In March 1951, the show pulled off another television first when NBC broadcast live, during Howdy's half hour, an eclipse of the sun as seen by a camera atop the RCA Building." "I remember watching that broadcast at home and my mother telling me not to look directly into the screen," Davis added. "She was afraid I’d go blind!" The Solar Eclipse – In Color! By an amazing coincidence, exactly 19 years after the world's first televised solar eclipse — on March 7, 1970 — a genuine celestial wonder (to quote Robert Coles) did take place: a total eclipse of the sun. This NASA graphic depicts the path of the March 7, 1970 total solar eclipse, which was visible to millions along the U.S. East Coast and other locations. That total solar eclipse tracked along the Atlantic Seaboard of the United States. Tens of millions of people were either within the total eclipse path — or within short driving distance of it. It was a memorable event, made all the more memorable by the fact that it was the first total eclipse to be broadcast on television in "living color." Here is a video of a special one-hour eclipse special that was aired by CBS on that Saturday afternoon. The program is in six parts. Joe Rao serves as an instructor and guest lecturer at New York's Hayden Planetarium. He writes about astronomy for The New York Times and other publications, and he is also an on-camera meteorologist for News 12 Westchester, New York. Click here for shuttle mission updates and a link to NASA TV.